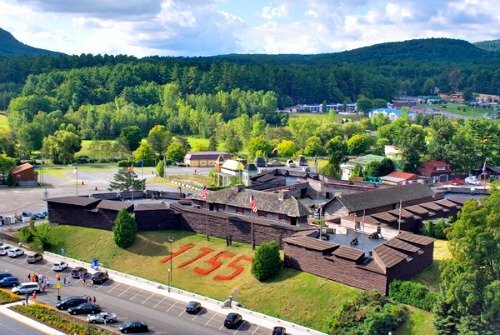 Fort William Henry was a British built and controlled fort on the southern side of lake George. Designed by British military engineer William Eyre, the fort was quite different from the standard design in its day since it was only really designed to withstand Indian attacks, and wasn't prepared for attack by artillery. It was a relatively small fort with only 4 bastions but its 30 feet thick walls still provided the protection needed. The fort was capable of holding any where between 400 and 500 troops, with any extra staying at an entrenched camp about 750 yards away. The fort held its own for most of its time but on the morning of August 8th, 1757 the French general Louis-Joseph de Montcalm attacked with some 8000 troops. On August the 8th after several days of bombardment the British were forced to surrender and the French General offered them terms accepted by the British commander. The agreement was that the remaining troops in the fort were to withdraw to the nearby entrenchment camp before departing for another nearby British fort. The French held their side of the arrangement but the Indian troops supporting them had other plans. After the British had left the fort the Indians came in and massacred the remaining wounded troops they had left behind, with estimates claiming around 200 British troops being killed. The Indians also tried to attack the British troops in the entrenchment camp and also followed the column most of the way to the next fort, and since the British were mostly defenceless as the French had taken all their ammunition, they were easy targets for the Indians, who kidnapped and killed many of the troops as they marched to their next position. Estimates as to how many of the column were killed or kidnapped range widely, with historians claiming anywhere between 200 and 1500 troops, as well as their wives and children were killed in the march to the next fort. Today the fort is open to the public as a tourist attraction but the original fort was destroyed by the French after they captured it. A replica of the fort was built in the 1950's and today it stands as a tourist attraction and museum. Is Fort William Henry Haunted? Even though the fort that stands today is only a replica, it still seems to be the home of the spirits of the original. The most well known individual ghost at fort William Henry is of an Indian chief named Taukolexis. The odd thing about this haunting is that the chief was executed by hanging from a nearby tree in 1696, which was a good few years before the fort was even built. Locals tell of how his spirit now resides around the tree which is said to still be standing to this day, and he also appears as a white glow in the area of the forts main entrance. As for the other activity in the area it all seems to be from the spirits of the British troops, most likely of which the ones that died in the massacre. The ghosts of the fort and surrounding area all seem to be residual hauntings, meaning that they are recordings which play themselves out over and over again instead of an active spirit. People have claimed to have seen everything from patrolling soldiers walking the walls to more chilling claims such as walking into one of the inner rooms and seeing the apparition of a wounded soldier moaning in pain before fading away into nothing.